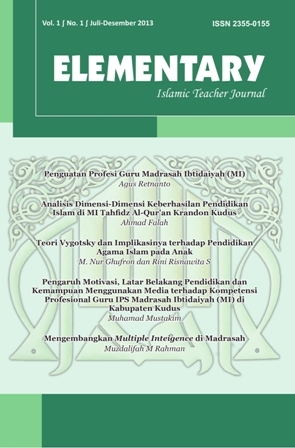 ELEMENTARY Journal (Print ISSN: 2355-0155; Online ISSN: 2503-0256) is an Islamic teacher journal published by Islamic Elementary School Teacher Education Study Program (PGMI), Islamic Education (Tarbiyah) Department, State College on Islamic Studies (STAIN) Kudus. Elementary is published twice a year (every six months, i.e. January and July) as scientific communication means of academic people in the study of Islamic Elementary School Teacher Education. Editorial Board receives the articles from the educators, observers, researchers on Islamic Elementary School Teacher Education to be published after having tight selection, peer review, and serious editting. Jurnal ELEMENTARY (Print ISSN: 2355-0155; Online ISSN: 2503-0256) adalah jurnal Jurusan Tarbiyah Sekolah Tinggi Agama Islam Negeri (STAIN) Kudus, terbit berkala (tiap enam bulan) sebagai wahana komunikasi keilmuan insan akademik dalam kajian Pendidikan Guru Madrasah Ibtidaiyah (MI).